The best page to get Einstein Bros menu prices. Einstein Bros. Bagels is a quick-casual neighborhood bagel and coffee shop that serves freshly baked signature bagels, fulfilling breakfast sandwiches, lunchtime sandwiches, sweets, and more. Mondays are extra special because guests can purchase 13 bagels for only $7.00. Einstein Bros. Bagels is committed to using simple fresh ingredients for their products. Bagels are baked every 4 hours so customers always get delicious tasting bagels. Who doesn’t love free bagels? One way to earn free bagels is to join the Shmear Society. By joining The Shmear Society, guests earn rewards towards free items plus, by being a member, guests receive additional special offers throughout the year. Guests with food sensitivities or food allergies should check out the nutritional guide here. All food in the kitchen is prepared using ingredients that contain all 8 major allergens. The best way to get noticed by the Boss is to knock it out of the park with a great catering event. If you are planning a breakfast gathering or lunch meeting, Einstein Bros. Bagels offers a variety of catering choices. Get noticed. As a way to promote breakfast food items, Boston Chicken created Einstein Bros. Bagels in 1995. Over the years, Einstein Bros. Bagels acquired several regional retail bagel chains. Today there are over retail locations across the US. Privately held Einstein Bros. Bagels parent company is Einstein Noah Restaurant Group which is owned by JAB Holding Company & BDT Captial Partners. 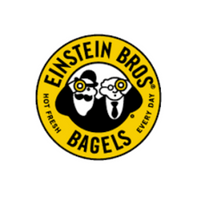 For more information about Einstein Bros Bagels, visit their official website. Does Einstein Bros. Bagels offer any vegetarian choices? Yes, there are several food items on the Einstein Bros. Bagels menu that are vegetarian. Does Einstein Bros. Bagels have gluten-free items? As of this posting, there are currently no food items being identified as gluten-free. Does Einstein Bros. Bagels sell gift cards? Yes, Einstein Bros. Bagels does sell gift cards. Guests can purchase traditional gift cards in the store. Guests can also purchase traditional gift cards online and have them mailed to the recipient. Alternatively, guests can purchase an eGift card and email it to the recipient. Just an FYI – it’s Shmear not Smaher (Extra Smaher) under bagel prices. Would like to know if i can order on line.